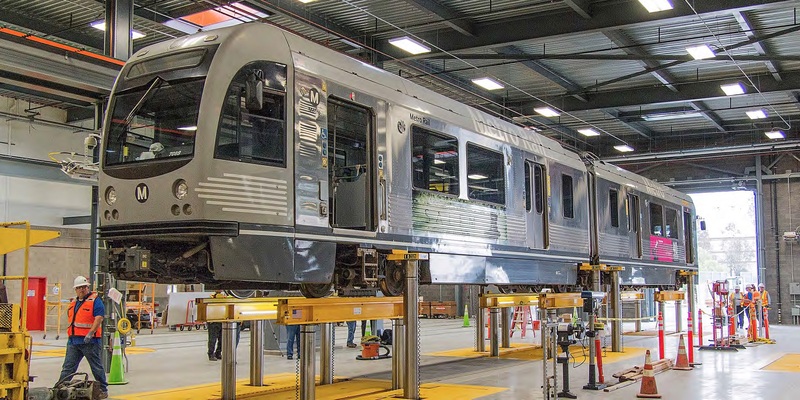 In collaboration with major railroads, Whiting has designed and manufactured rail maintenance equipment that can be found in almost any major heavy locomotive repair shop throughout the country…and the world. Light, medium and heavy repair shops count on the reliability and durability of Whiting manufactured lifting equipment. Whiting CMAA compliant cranes are used to lift and position body and truck materials for the building and repairing of freight railcars. Whiting’s rugged design and service class of equipment provides the reliability necessary for the production of railcars that move and fuels the railroad industry. Dependable, service tested Whiting maintenance equipment is available in a variety of arrangements to speed maintenance and reduce costs and downtime. Electric motor powered multi-hoist units can be arranged to lift single or coupled cars. All units are synchronized and interlocked to maintain minimum elevation variations. Use of the mechanical screw and nut principle allows hoisting and holding at any position within the complete range of the hoist.